What Is The Difference Between Grades Of Chain? Different grades of chain are used for different applications. It is vital to understand these differences when choosing the proper chain grade. Chain Grades - What Does G30, G43, G70, G80, G100 and G120 Mean? Chain is graded based on the ultimate breaking strength of the chain, measured in N/mm2. 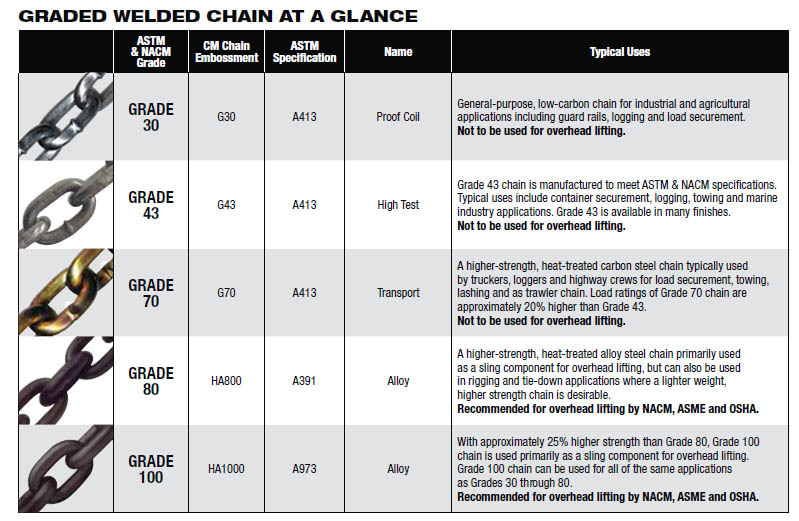 The American Society of Testing & Materials (ASTM) has published safety standards and regulations for these chain grades. See chart for ASTM Specification number. 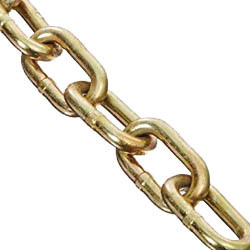 Grade 30 chain is a general purpose chain often used in industrial and agricultural applications. It can be used for load securement but is of less strength than Grade 43 chain. 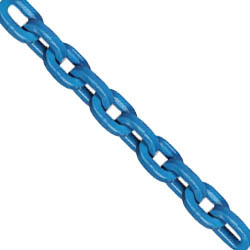 Grade 43 chain is used in container securement, logging, towing, and marine applications. It is stronger than G30 chain and is available in many finishes. G30 or G43 chain should not be used for overhead lifting. 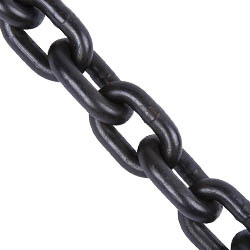 Grade 70 chain, or G70, is constructed of high-strength, heat-treated carbon steel. It is used by truckers, loggers and highway crews for load securement, towing, lashing and as trawler chain. G70 chain is rated at 700 Newton / Square millimeter or 101,526 Pound-force per square inch. It should not be used for overhead lifting. Currently, alloy chain of Grade 80 or Grade 100 should be used for overhead lifting. Newer and stronger still is Grade 120 chain. Any lower grade chain should not be used. 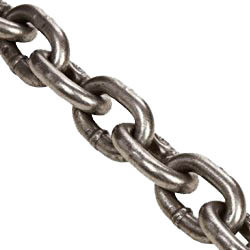 The ASTM states that "alloy chain shall be able to elongate a minimum of 20% before fracture". When the chain is in use, no amount of stretch is allowed. This chain is constructed of heat-treated alloy steel and is used primarily as a sling component for overhead lifting. 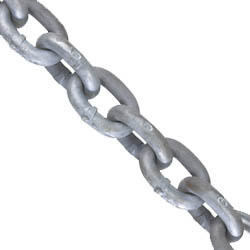 Grade 80 chain can also be used in tie-down applications and is seeing much more usage as thus. This chain is similar to Grade 80 but is approximately 25% stronger. It is also primarily used in overhead lifting applications but can be used for any applications done with any other grade of chain. 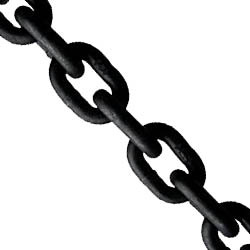 Grade 120 chain is newer and is currently the highest strength chain in the industry. This chain provides a 20% higher strength than G100 and 50% higher than G80. The chain has a bright blue finish for visibility. Higher grade chains are commonly used for lifting applications but can also be useful for cargo control tie downs. The higher capacities can allow for less total number of chains, depending on the application.